Top : Powerboats V-hull : Sportfishing : Flats and Bass Boats : Bay Craft Inc.
We build boats because we love to fish. And we understand what a fisherman demands in a boat. A fast planing hull that can run flat out in six inches of water, or handle the best the seas have to offer. We offer features other manufacturers can only dream about. Shallower drafts, 100% fiberglass construction, stainless steel hardware, and at an affordable price. Web Site Snapshot: If available, above is a snapshot of the Bay Craft Inc. web site at http://www.baycraftinc.com as it appeared when this site was added to the directory or last verified. 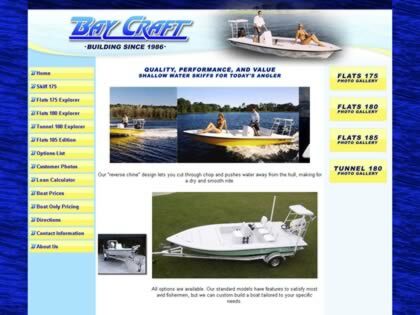 Please Note that Boat Design Net has no involvement with the above web site; all content and images depicted in the above thumbnail are the property and copyright of Bay Craft Inc. unless otherwise noted on that site. Description: We build boats because we love to fish. And we understand what a fisherman demands in a boat. A fast planing hull that can run flat out in six inches of water, or handle the best the seas have to offer. We offer features other manufacturers can only dream about. Shallower drafts, 100% fiberglass construction, stainless steel hardware, and at an affordable price.